Looking for an unforgettably posh vegan afternoon tea in Victoria? On a layover during a recent Taiwan press trip, I wanted to visit my daughter who had recently moved to Victoria and treat ourselves to some seriously posh pampering before I headed home to Montreal. 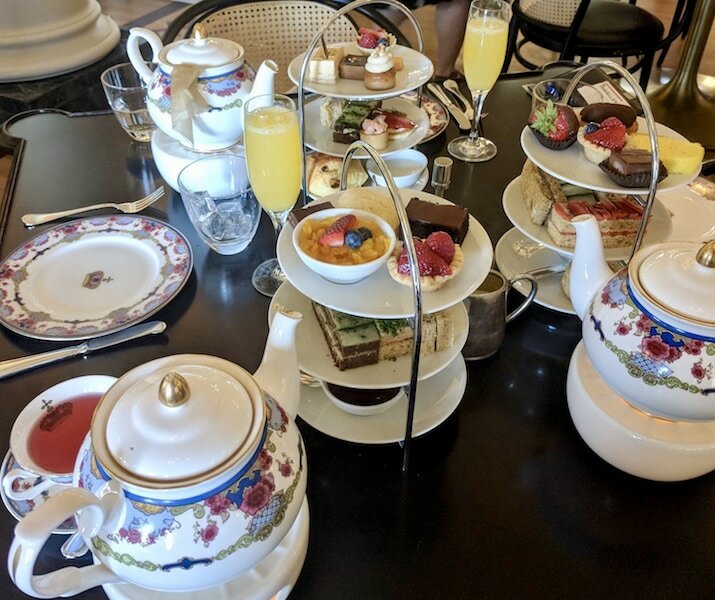 Served in the glamorous Lobby Lounge at the Fairmont Empress Hotel, the deliciously decadent Vegan Afternoon Tea was a highlight of our Mother-Daughter reunion in Victoria. I was a tad jet lagged from all that travel, and frankly, just tired of airplanes. So, I decided to try a different way to travel from Vancouver to Victoria: luxury ferry. 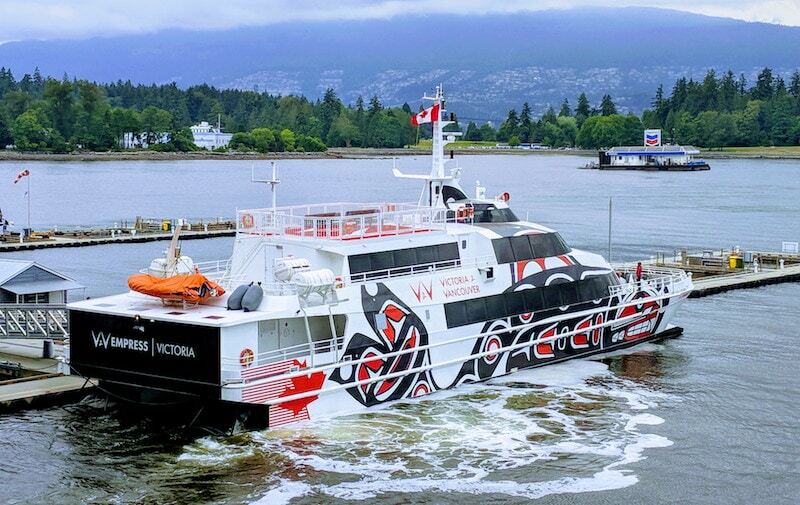 I’d heard there was a brand new way to go from downtown port to downtown port between the two cities, it’s called V2V Vacations (Vancouver 2 Victoria). 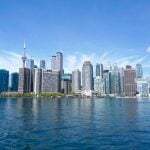 Although it takes longer on the water than the regular ferry, it’s a much more pleasant experience, more of a trip than a transfer, and you don’t need to travel 30 minutes by highway at each end to get to the downtown cores. It’s important to note that if you’re planning to go exploring on a layover in Vancouver (or any other airport), it’s much easier if you’ve got only a carry-on bag, so you’re not dragging a huge piece of luggage with you or paying for storage. Not every airline has the same size restrictions so check this Carry-on Size Chart for guidance on what’s allowed. Since I was enroute to the Fairmont Empress Victoria I figured I should start the journey right and opt for their Royal Class while on board. 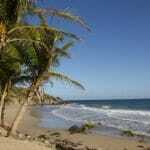 The experience was just what I needed to recharge before the next leg of the adventure. The V2V ferry features luxe leather reclining seats, a lovely lunch with wine, free wi-fi and plush blankets if you want to nap. The Royal Class also affords a great panoramic views of the Strait of Georgia and Strait of Haro along the way. Sadly, it was a little drizzly that day, so I didn’t spend a lot of time on deck, but I did run up when the captain told us they spotted a pod of orcas, and we did catch a few glimpses of them. That was exciting. The ferry dropped me right in front of the Fairmont Empress Hotel in time for our afternoon tea in Victoria. It doesn’t get any more convenient than that. High Tea vs Afternoon Tea – What’s the Difference? If you’re looking for high tea in Victoria, it’s important to understand the difference between High Tea and Afternoon Tea. When most North Americans think High Tea, they think of the three-tiered fancy china set with the dainty sandwiches, scones and goodies served in the mid afternoon. That’s actually a traditional Afternoon Tea, originally enjoyed by high society. High Tea as it’s known in the UK also features a warm, hearty dish such as a casserole, baked beans or fish and is more of a working class experience served around 5 pm. It’s a common misconception to confuse the two. 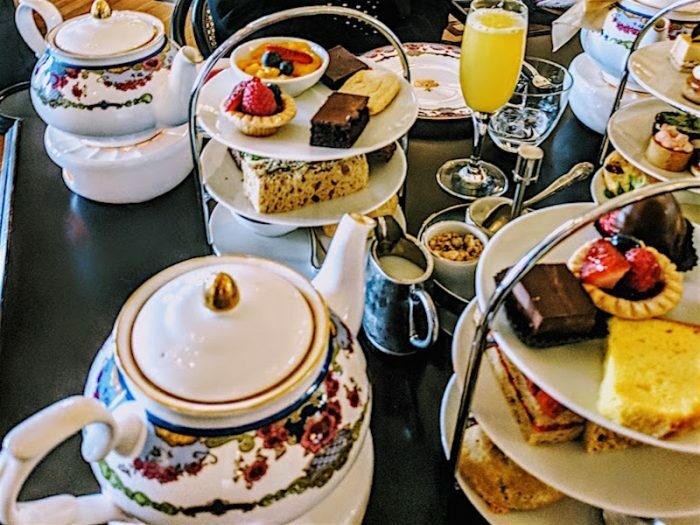 Although “Afternoon Tea” doesn’t sound nearly as fancy as “High Tea”, when it comes to a posh afternoon tea featuring a mix of sweet and savoury treats, it doesn’t get much fancier than Afternoon Tea at the Fairmont Empress Victoria. If you’re looking for high tea at the Empress, it’s known as Afternoon Tea and has a long and illustrious history. Featuring an iconic chateaux-style architecture, the Fairmont Empress opened in 1908 and in June 2017, wrapped up a $60 million restoration that preserves its proud history yet vaults the hotel into a modern era of luxury. 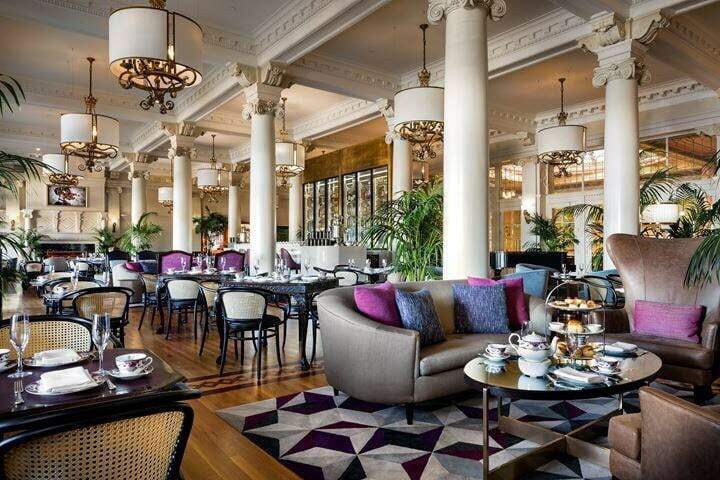 Served daily since opening, Tea at the Empress is served in the glamorous Lobby Lounge. 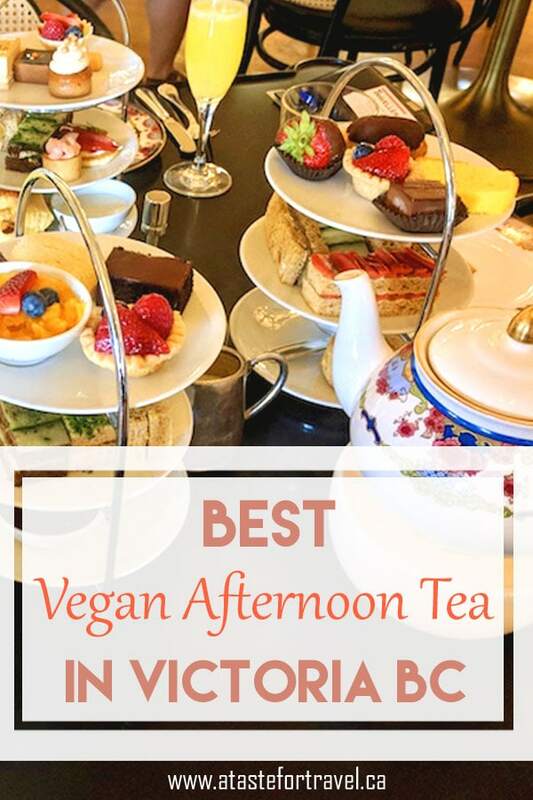 It also happens to be the top spot for vegan afternoon tea in Victoria. I had heard great things about the Afternoon Tea at the Fairmont Empress Victoria but was concerned that they might not be able to cater to my daughter’s vegan diet. Turns out I had absolutely nothing to worry about. Surprisingly, although the tradition of serving Afternoon Tea goes back to 1908 at the Empress Hotel Victoria, they are very contemporary and up-to-date with modern trends in dietary needs. Their thoughtful menu can cater to up to 32 different dietary restrictions including sugar-free afternoon tea, gluten-free afternoon tea, vegetarian afternoon tea, dairy-free…you name it, and still offer a delicious array of tiers fit for royalty. In fact, our tea sommelier server had actually personally served Queen Elizabeth II there a few years ago. I ordered the regular afternoon tea and their special new blend of tea dedicated to Meghan Markle, now the Duchess of Sussex. Served on their custom-made china, it was beyond excellent … decadently delicious and very filling, too. Everything one would expect for this type of elevated experience. We felt very fancy indeed. I was especially impressed by the creativity of the vegan selections on the vegan afternoon tea at the Empress Hotel. The vegan afternoon tea menu started with a scone made with strawberry lavender jam (locally sourced strawberries and lavender from the Empress Hotel’s herb garden on the roof). The second tier consisted of four dainty sandwiches that included local heirloom Sun Wing English cucumber on rye, truffle artichoke and red pepper pinwheel on rye, Moroccan spiced eggplant on whole wheat, and carrot and cardamom on whole wheat. Last but not least, the dessert plate consisted of dark chocolate bark, devil’s coconut fudge cake, spiced wild berry tart, mango passion tapioca pudding and vegan shortbread. All teas served at the Empress Hotel are certified by the Ethical Tea Partnership. All of this was nicely paired with the Bella Coola organic herbal tea, which is light with a sweet taste of tropical pineapple. In total, there are 21 tea blends to choose from at the Empress Hotel Victoria. In addition to the original Empress blend created by the Metropolitan Tea Company and the rare Tong Mu Phoenix Lapsang Souchong blend, all of the tea at the Empress is ethically sourced and certified by the Ethical Tea Partnership. I found myself eyeing my daughter’s tiers on the fine china afternoon tea stand wanting a taste too, but she was not offering. It’s tough to find fancy vegan treats like this, so she was over the moon and not wanting to miss a bite. We chit-chatted the afternoon away while gazing out onto the iconic Inner Harbour with the background of beautiful classical music being played on a grand piano behind us. Once sated, we were ready for some royal pampering at the spa. Willow Stream Spa is within the Fairmont Empress and although independently operated it seamlessly reflects the posh vibe of the hotel throughout its operations. We both enjoyed the ultra-relaxing Salish Sea Vitality Face 90-minute treatment with seaweed extracts. And I love a spa treatment with a great back story. The spa is the exclusive supplier of Seaflore Skincare a leader of “seaweed science” and big promoter of green practices. The seaweed is hand foraged locally by Diane Bernard who is known as “the Seaweed Lady”. She actually also gives thalassotherapy educational seminars and wild seaweed tours. It was my first visit to Victoria, so my daughter showed me around her new home city. It’s so scenic and charming and easily walkable, we ended up at a rollicking Irish pub to toast the town in style. And the bonus was that it had the largest selection of Irish whiskey in Canada! They also had a killer good live band playing, and the place was hopping. It was an ideal way to way to cap off our Mother-Daughter royal reunion with a jigger of quality hooch and a jig to lively music. After all, though we enjoy going upscale there’s nothing wrong with some good old downhome fun, too. As I needed to get to Vancouver airport quickly for my trip home.I left Victoria the next day in a luxurious way. I tried the helicopter service from downtown Victoria right to downtown Vancouver with Helijet, a helicopter service operating between Richmond, Vancouver, Victoria, Nanaimo, Prince Rupert and Haida Gwaii. The flight afforded fabulous views and took a mere 25 minutes from port to port. Again, not so much a transfer as a trip well worth taking in itself. Disclosure: By providing handy links to affiliates such as Amazon and hotel booking sites, we may earn a small referral commission and you don’t pay anything extra. The writer was hosted for this press trip. All opinions are 100% her own and we only link to products and experiences we think readers will enjoy. Read more on our Disclosure Page. Interested in staying overnight at one of Canada’s most famous luxury hotels? Click here to check prices on the Fairmont Empress Victoria on Hotelscombined.com, a search engine that compares room rates on hotel booking sites such as Expedia and Booking.com to find you the lowest rate. Planning a trip to Victoria? Save it to Pinterest! We will be in Victoria in September 2019. I will be sure to try this Afternoon Tea at Fairmont Express Victoria. Too bad we will be driving and won’t experience your luxury ferry and heli! I love Victoria and always enjoy visiting. I’ve not had afternoon tea at the Fairmont (although I have had it at the nearby Gatsby Mansion and that was delightful). I didn’t know they had a vegan option. My daughter is also a vegan and it might be fun to take her next time we’re in Victoria together. OMG! I’ve been to the Empress for tea but it seems like it’s getting better and better! What a memorable (and tasty) experience. It’s been many years since I enjoyed tea at the Empress. Loved going back with you. I’m amazed the kitchen can cater to up to 32 different dietary restrictions! I will pass this along to my adult children, both of whom are vegans. 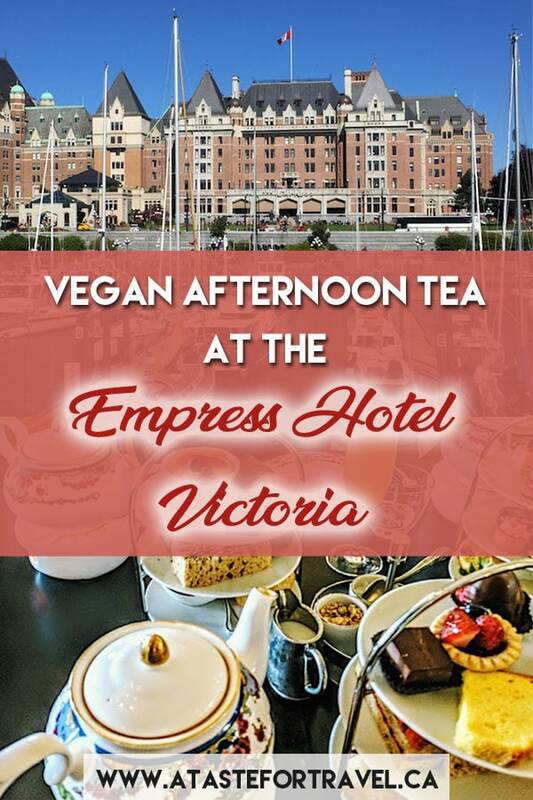 I will be in Victoria at the end of this year and I will definitely try vegan afternoon tea. What a great option! Thank you so much for your sharing! Thanks for detailing what the vegan tea has for offer. Yours is one of the first results when one googles “Vegan tea at the empress”. Great news! 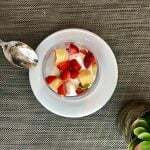 Thanks for letting us know you found Jess’ vegan post helpful!